Interested in coaching with SOCA? We are always looking for dedicated soccer coaches committed to a common goal! Click here for the SOCA Coaching Application. Looking for SOCA Full-Time Coaching Staff? Click here. All coaches should attend the pre-season coach meeting for the program they are working in. Not only is vital administrative information distributed, but informative coaching clinics accompany every meeting. SOCA prides itself in providing the best soccer coaches (USSF National ‘A’ and ‘B’ License and/or NSCAA ‘Premier’ and ‘Advanced National’ Diploma) at its highest levels while also providing continuing coaching education opportunities for all levels of coaches. Without the exceptional volunteers that step forward each year to help SOCA’s Recreational program, SOCA’s youngest players would not receive the first experience necessary to develop and sustain a passion for the game of soccer. But regardless of the level at which any of us coach, continuing coaching education is vital in our own personal coaching development but also crucial in providing the most modern training methods and developmentally correct training and game environments to all of our aspiring players involved with SOCA. Soccer coaches have the unusual distinction of being some of the best educated coaches in youth sport. There are few other sports in the United States which provide such an extensive opportunity for coaching education. The United States Soccer Federation (USSF) established its coaching courses about 30 years ago. The licensing sequence is intended to provide an appropriate level of education to coaches from the youngest youth level right through the most advanced play. All of SOCA’s coaches are encouraged to obtain the license appropriate to their level of interest. In the Express program, licenses are required. In the Challenge program, licenses are strongly encouraged. SOCA hosts an “F” module, “E” license and “D” license each year. The club pays for all tuition fees provided that the coach agree to participate in the SOCA program for a minimum of the next two years. In addition, SOCA will accept applications for tuition grants for coaches to attend the National “C”, “B”, and “A” level courses. The “F” modules and the “E” and “D” licenses are offered through the various state associations. In our case this is VYSA (Virginia Youth Soccer Association). Each club may host any one of these courses by making application to the state office. The “C”, “B”, and “A” courses are National level licenses which are offered at various sites around the country. These are residential courses requiring a 10-14 day long stay. “F” Modules. This is the entry level course for youth coaches. The curriculum has recently been adjusted to train coaches in these age group modules: U6/U8, U8/U10, and U12. Each module is a five hour course. Emphasis is on understanding the developmental stages of the different age groups. Technique is the focus. Coaches receive instruction in coaching philosophy, injury care and prevention, and team management. SOCA will be hosting these courses for Recreational and Challenge coaches. “E” License. This course is geared toward 12-16 year old players. This is the first step for serious coaches. Technique is again of central importance, however, the basics of tactics are introduced in small increments of 1-3 players. Philosophical, injury, and management issues are covered in more detail. The primary benefit of this course is the clear presentation of a coaching methodology. Understanding how to teach material to players significantly increases a coaches effectiveness. This is an 18 hour course. “D” License. This is the highest state level course. It is designed for players 15 years old and older. Advanced technique and group tactics of 3-6 players are the core of the course. Further development of coaching methodology, with an elaboration of structuring sequenced training sessions around a single theme, are key elements. Team management, Laws of the game, match analysis, and injury issues are covered in depth. Candidates are tested in both classroom and field work. NEW: The 32-hour course is still two weekends (Friday-Sunday) however they are now split between 8-10 weeks. This will allow for candidates to go back to their home clubs and test/experiment with the first weekend’s material. After 8-10 weeks candidates will return for the second weekend which will include on-field and classroom testing. “C” License. This is the first national level license. Major points of emphasis are: technical refinement, group tactics (3-7 players), principles of team play, match analysis, and a thorough understanding of the coaching progression. Fitness training, team management, scouting, and player psychology are also covered. “B” License. The focus in this course is on large group tactics (6-9 players), specific functional training for individual players, and further developing earlier material in greater depth. “A” License. The pinnancle of the USSF Coaching Education pyramid. Here the emphasis is on team tactics and strategy (8-11 players) along with advanced review of all previous topics. Any SOCA coach interested in pursuing these licenses, or if you would like further information, contact the SOCA Office, at 434.975.5025. The ‘National Diploma’. 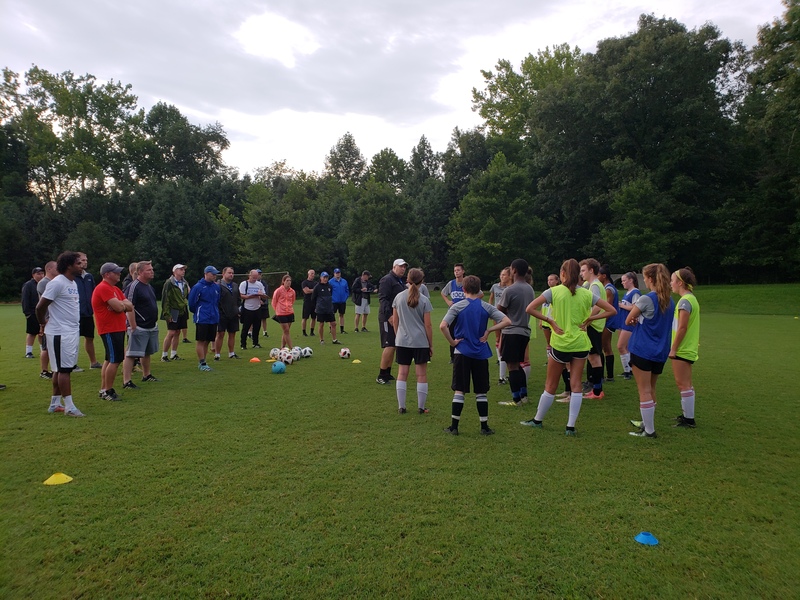 A 50-hour course designed to meet the needs of the more experienced coach, particularly those coaching at the high school level and above, or youth coaches with previous certification and a number of years working with the developing player. It is strongly recommended that candidates complete the NSCAA Advanced Regional Diploma or USSF “D” license prior to the course. Some USYSA affiliates will only recognize the NSCAA National Diploma if they have completed the state association’s USSF “D” license. Please check with your state association for details. The overall objective of the National Diploma is to acquaint the coach with the needs of the American soccer player and provide an organized and progressive methodology of coaching those needs. Basic technical and tactical knowledge is the central theme of the course in a 6v6 model. The course includes sessions on the teaching process, psychological skills training and Laws of the Game. Participants receive a curriculum that outlines the course content and includes valuable resource material. Testing includes oral, written and practical (coaching) evaluations. Applicants must be at least 18 years of age. The ‘Advanced National Diploma’. A 50-hour course designed for the experienced coach working with the advanced player. The emphasis is on training those players within a team concept designed to produce a successful environment. The 8v8 model is the main focus. Acceptance into the course requires an NSCAA National Diploma, the USSF “B” or an English UEFA “B” license. A minimum of 10 years of coaching experience at an appropriate level also is suggested. The ‘Premier Diploma’. The pinnacle of the Residential Academy offerings. It is a 50-hour course designed to teach advanced methodology with full-sided soccer (11v11) as its focal point. Coaches are provided a course curriculum. The course content includes a thorough examination of different systems of play, including: technical and tactical implications; 11 v. 11 topics, including coaching in the game, phase play and shadow play; nutrition; sportsmanship/ethics; and a leadership component including team management, personal development and the coach’s role in game development in his/her community. Eligibility for the Premier Diploma requires the applicant be an NSCAA member and have the Advanced National Diploma, the USSF “A” License or English UEFA “A” License. Candidates with a “Distinguished Pass” in the NSCAA Advanced National Diploma will automatically qualify for entrance into the Premier Diploma. Additional factors, such as coaching and playing background, community leadership and contribution to the game, are considered. Applications are screened by the Director of Coaching Education and enrollment is limited for each course. A special form is available in the January/February and May/June issues of Soccer Journal and is required for application to the Premier Diploma. No applications are accepted after established deadlines. SOCA is pleased to offer written and video resources for all SOCA coaches through our lending library. The library is located at the SOCA office. A maximum of three items may be checked out for a maximum of two weeks. Some items are for reference only. Please take advantage of these resources. If you are in need of ideas or are looking to improve your knowledge in specific areas we may have something which can help you. Total Soccer Equipment Discounts – Downtown Athletic Company has been a generous supporter of SOCA and its coaches for over 30 years. As an extension of this relationship, Total Soccer is offering coach’s discounts on a year round basis. To receive discounts on merchandise in the store simply alert their staff that you are coaching in one of SOCA’s programs. Total Soccer is located in Seminole Square Shopping Center at 194 Zan Road off of 29 North. NSCAA Discounts available for SOCA coaches, contact SOCA Coaching Director for more info. The half-time break is the one chance we coaches have to impact the game significantly. Closely observe the first half of play so that you are familiar with all aspects of the game: the field, the weather, the referees, the opponent, and your own team. The temptation is great to say too much during this critical break. There is much to accomplish in a very short time, don’t muddle it all by lengthy lectures. You will not be able to teach players new habits, or break them of old ones, during half time. Remember, the half time interval is foremost a break for the players. The following are a few tips for maximizing the usefulness of the interval. Be prepared. Having carefully observed and analyzed the first half, know precisely what you will say. Be brief, don’t ramble. Don’t be caught off guard, know exactly when half-time is coming, know where you will take the team. Allow for rest. Get the players quickly away from the bench, parents and spectators. Get them off there feet and out of the elements, if possible. Try to make them comfortable. Allow for player discussion. Players will be excited, allow them the opportunity to blow steam or congratulate each other, etc. Give them a few moments of their own. Water. The universal elixir. Make sure that all players get plenty of water. Avoid soda completely. Dilute sports drinks with water. Assess any injuries. Take a moment to examine recent injuries, ask about chronic injuries. Make adjustments as necessary. Team adjustments. Keep it simple, keep it brief. A good guideline is to make one overall offensive and one defensive correction. Players can not handle too much instruction under the duress of playing. Never introduce new concepts at half-time. Individual adjustments. In some situations it may be desirable to give individual instructions to certain players. Do this sparingly and only with those players who need it and are capable of processing the information. Substitutions and alignment changes. The break is an ideal opportunity to make substitutions or to move players about on the field. Make sure your instructions are clear and that the proper number of players re-enter the field. Calm them/excite them. A good rule of thumb is that the coach’s job is in part to calm down those players who are over-excited and to excite those players who are under-motivated. Use the moment prior to re-entering the field to get your team and the individual players in the proper frame of mind.